When it comes to success in the software industry – the customer is still always right. This attitude is one of the reasons Wingify has been so successful at securing nearly 4,000 customers for its VWO (Visual Web Optimizer tool) including small businesses and big brands like Microsoft and Rackspace, all without any funding. In fact, Paras Chopra, CEO at Wingify only invested $30 when he coded the first version nearly four-and-a-half years ago. Since then, Wingify has been focused on making its VWO customers successful. Additionally, Wingify has been very prominent in educating the market about A/B testing in general with more than 400 articles and best practices on its blog. 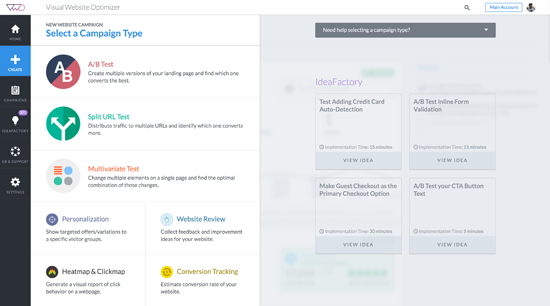 Along with its robust offerings – A/B testing, split URL testing, multivariate testing (see image), heatmaps and its Idea Factory which provides ideas about what to test – VWO has entered the mobile testing market. Its users can A/B test responsive websites and different websites (e.g. desktop or mobile) independently, as well as mobile apps. 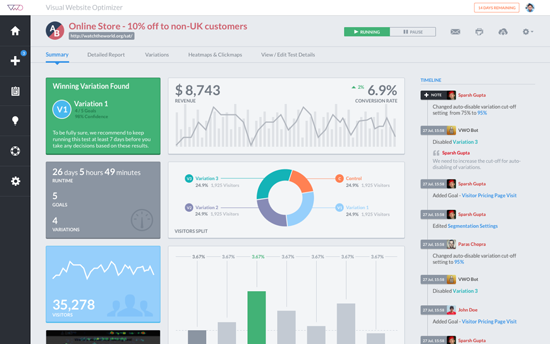 What’s more, VWO is offering a new user interface, which is now a single-page application. Chopra says it loads very quickly, making it a fast experience for his users (see screenshot of the VWO main dashboard below). VWO also launched more segmenting capabilities, which, according to Chopra, are more robust than what his competitors are offering. For example, a user can look at testing results as specific as people who came to the site from New York, who used an iPad and only log on to the website on the weekend. As far as Chopra is aware, no other vendor in the testing space offers this capability. Moving forward, VWO has been very focused on the ideas part of its tool. VWO’s Idea Factory contains these ideas and already has more than 300 resources that will be expanded by industry. What's particularly useful about Idea Factory is that the different testing suggestions come with how long the tests would take to implement (e.g. 30 minutes). VWO is also expanding on gathering feedback from users. Website Reviews is a feature that utilizes a group of users who answer questions like, “what are three things you don’t like about the website?” This helps VWO users gather qualitative data to further their testing initiatives rather than relying on hunches.